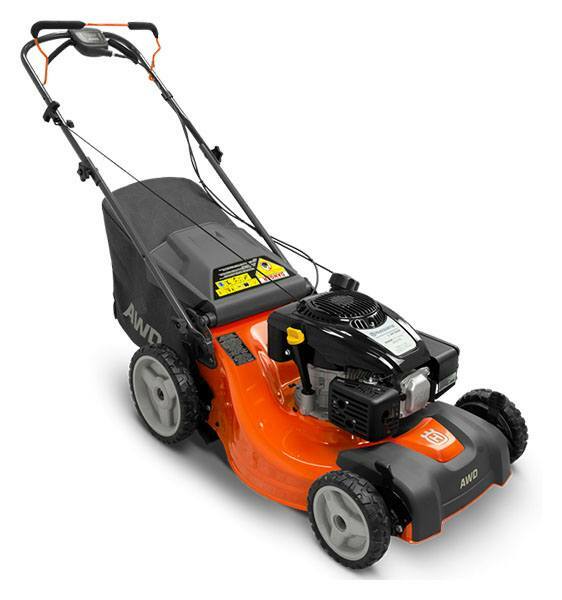 The 21" 15-gauge steel high performance cutting deck from Husqvarna integrates the latest advancements in technology and development with traditional design, providing a hi-tunnel mower intended to meet the highest expectations in cutting performance. For some mowers, a large capacity bag might be a challenge, but when your mower is powered with Husqvarna's All-Wheel-Drive there's more than enough capability to carry a full load; through thick turf and other challenging terrains. Equipped with engineered tread and All-Wheel-Drive with the added benefit of improved unit balance, these new mowers are sure to please from the postage-stamp yard professional to the rural weekend warrior. KOHLER ENGINE: The high-performing Kohler XTX775 engine features 7.75 foot-pounds of torque. AUTOWALK™ 2: The two-hand speed control makes it possible to shift between using right or left hand for the variable speed adjustment. This ensures ergonomic operation and also makes it easier to mow along hedges and around obstacles, as you can release the grip of one hand and the mower keeps running. ALL-WHEEL DRIVE: All-Wheel-Drive (AWD) ensures traction on uneven, wet and slippery areas and slopes. The result is full traction and superior performance in all turf conditions, on pavements and off-road. The system also makes sure turf damage is minimal. HIGH REAR WHEELS: High rear wheels for less effort and rubber tread for durability. REAR DISCHARGE CAPABLE: Capable of rear discharge to tame high unruly grass.